Within the next 12 months, General Motors will phase out its aging 2.4L Ecotec four cylinder engine and replace it with the more powerful, more refined, and more efficient 2.5L Ecotec engine. We first expect to see the new motor in the base 2013 Chevrolet Malibu, when it launches later this year. Afterwards, look for the 190 horse, 180 lb.-ft. engine to be found in the Buick Regal and Verano, Chevy Equinox and GMC Terrain. It’s also going to be found in the base model 2013 Cadillac ATS. Still unconfirmed is whether or not the new engine will replace the 2.4L in eAssist applications. Is this a revamped “Iron Duke” 2.5? That engine was a trooper! I doubt it will be a revamped Iron Duke. Slightly off-topic, but looking at the belt driven accessories, I had a thought. I assume the upper right pulley is the water pump. If power steering has been converted to electronic assist, and electric water pumps are also common, why not also remove it and the A/C compressor and make them electrically driven? That would leave only the alternator reducing HP losses. It would allow for more flexible packaging of the HVAC items and eliminate the need for a A/C clutch. The alternator bracket could have the tensioner built-in removing an idler pulley. And with the high degree of wrap on the alternator pulley, less tension would be necessary reducing bearing load on the alternator and front crank bearing. Is there any reason why this hasn’t been or shouldn’t be pursued? Good thinking, my guess is that electric motors are more expensive and that the environment of an engine compartment is more harmful to them than a mech pump. That’s my GUESS. Here’s my follow up: Why not a revamped Iron Duke? The 5.3 liter V8 is the same small block engine GM has made over 100 million of at its core, and the 4.3 V6 is that same engine again with the back two cylinders cut off. The 3.8 V6 has survived for many decades now although I think its gone for good. GM uses an engine that works as long as they can and the Iron Duke WORKED. I think there are ways around the heat issues. The A/C Compressor could be integrated into the HVAC system or located even closer to the condenser coil at the front. Electric water pumps seem to do well in race applications. and the power steering has already been tackled. Another thought I has was eliminate the belt all together and drive it directly from the crank. According to the Wiki page on the Iron Duke, “The SD4 was the last in a line of high performance Pontiac “Super Duty” engines. Kansas Racing Products still makes the engines after buying the rights to make them from GM.” I don’t know if the rights apply to those race versions or all versions of the ID, but it does seem to complicate a return. Plus, the Ecotec engines were more advanced then the iron duke (twin balance shafts, aluminum block with iron sleeves, direct injection, etc), were quieter, and are significantly more energy dense. The 5.3 liter V8 does not have the same block that’s been used for 100 million. Sure, it’s an evolution, but the only thing it has in common with its predecessors is bore spacing and similar displacements. 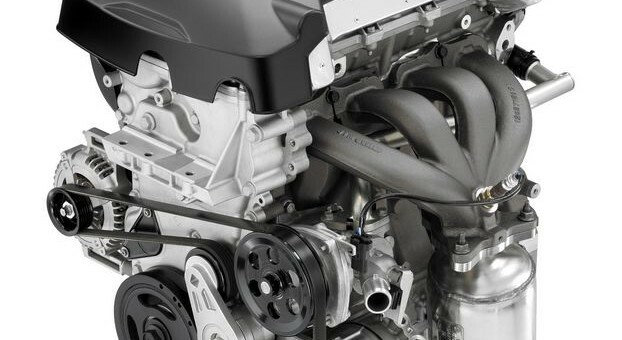 When will this engine appear in the Verano…this year or in Fall for new model? I also wonder if the designers will redo the grill and too-big lights??? Most likely for the 2013 model year, but this is not confirmed. And what’s wrong with the grille and lights? I love them, personally. do u know when the equinox will get this engine upgrade?and what other models itll be added on and when ? Yes, the 2.5 will replace all instances of the 2.4. We’re not clear about the timing yet, but it’s very likely to be within the next year. Alex, have you heard of any update as to when the equinox will get the 2.5L engine. I am looking to order a 2013 nox and was wondering if I would be able to get it this fall or would it be in the spring. Hopefully I don’t have to wait till 2014. Any info would be nice to help me to diecide if I want to wait to place my order. Is there an update to when the 2.5l ecotex will be available in the equinox. I am in the market for a new car and am waiting for this engine to be avaiable. It has been almost a year since this article has posted. I recently purchased a new 2014 Buick Verano with this engine and I am extremely pleased and surprised. Of course I am not a young person that wishes to have tons of horse power, or a so called chic car, but the Buick Verano is a good ride for the money and is worth a serious look. If you are looking for a safe and upscale car that is mostly made in the U.S.A., Buick once again surprise me, it not for the old person anymore. Even though I am in my sixties and married, this is a great car, with a very surprisingly engine, thanks Buick, thanks GM. I am beginning to once again trust and enjoy cars from America. God Bless.